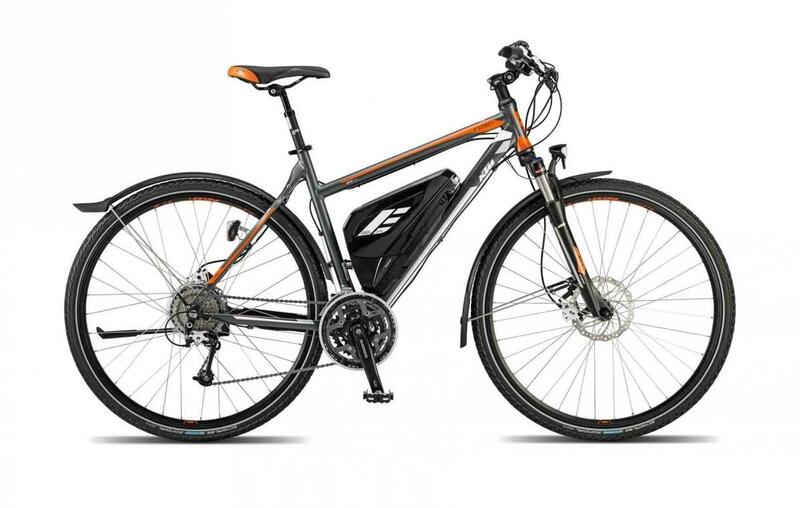 KTM make a small range of Panasonic hub driven eBikes. These bikes have a great reputation amoungst all those who have ridden them, and offer a real alternative to the crank driven eBikes that are also available. We're focussing on the eStreet P today because it offers leisure and commute cyclists an excellent out of the box solution. The bike comes equipped with lights, mudguards, full hydraulic disc brakes, suspension seatpost and forks, along with an adjustible stem and 30 gears. The Panasonic system uses a 562w battery to give a huge range. The hub drive is 250w nominal power rated so fully UK road legal and classified as a bicycle so no tax, insurance or license is needed to ride one of these, its legally classed as a normal bicycle. The hub drive is a very efficient system, so in its top assistance mode the bike will provide 400% assistance to the power the rider puts in. The hub drive puts less strain on the drive chain as the extra power is applied directly to the wheel rather than having to go though the chain. The Panasonic drive is a firm favourite of the staff here at FLi.